Local family Butchers, Aubrey Allen, have trained the next generation of award winning butchers. Daniel Symes, 18 of Leamington Spa, made it to the final of the Premier Young Butcher competition organised by the National Federation of Meat and Food Traders and hosted by William Reed Business Media at Foodex, Birmingham NEC on Monday 16th April. 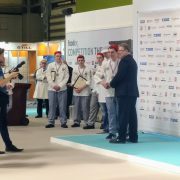 Ably coached by World Champion Butchers and mentors to Aubrey Allen apprentices, Martin Crombie and Michael Perkins, Dan faced a nerve-racking competition that lasted six hours and played out under the watchful eyes of judges and the public at the Foodex exhibition. There were just seven butchers from around the country chosen to compete after being shortlisted and only one from Warwickshire all competing to take the title of Premier Young Butcher. Dan battled through to take first place in the seam butchery category and runner up in Stuffed roast category. Dan joined Aubrey Allen in 2016 and was signed up to the Trailblazers Apprentice scheme.